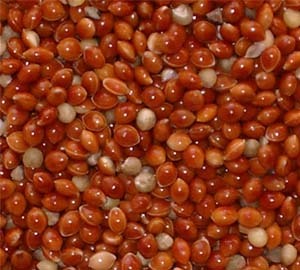 Red mIllet is a small-seeded grain, it is the equivalent to wheat and corn in Western diets. Because of its higher levels of protein and lower production costs,red millet has lots of benefits to health and social responsibility. Nutrients Red millet is high in several essential vitamins and minerals, containing between 10 and 20 percent of the USDA recommended daily value of thiamin, niacin, magnesium, phosphorus, zinc, copper and manganese. It contains smaller, but still significant, values of riboflavin, vitamin B6, folate and iron. Red millet does not naturally contain any sodium but is often cooked with salt or sodium-rich sauces. Protein Profile One cup of cooked red millet includes 6 grams of protein, about 12 percent of the USDA daily recommended value. Because it comes from a plant source, this is an incomplete protein. It contains only some of the amino acids your body needs, but is unable to build for itself. For a complete protein, it must be eaten with foods that contain the missing proteins, such as legumes, nuts and seeds.